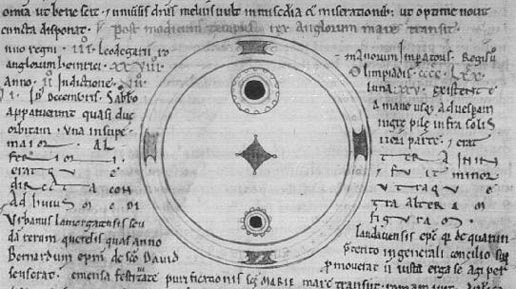 12th century sunspot drawing, from NASA. Since the invention of the telescope in the 1600s, observers have recorded variations in the numbers of dark spots – “sunspots” – on the Sun’s surface. These variations normally follow a regular cycle with peaks 11 years apart. This cycle coincides with a small oscillation in solar energy output. The Sun’s energy output is slightly higher during periods with large numbers of sunspots. It is difficult to prove a direct relationship between the sunspot cycle and climate, but some climate events coincide with sunspot numbers. For example, between the years 1645 to 1715, the number of sunspots was dramatically lower than previously observed. This period is known as the Maunder Minimum. It is hypothesized that the reduction in solar energy output during the Minimum could have contributed to a slight cooling of the Earth. The historical record supplies some supporting evidence. The period between about 1400 and 1850 is called the Little Ice Age in Europe. In geological terms, the Little Ice Age started and ended very quickly. During this time, Europe was on average 1 degree to 2 degrees C cooler than it is today, but that’s all it took to have the Thames River in London freeze over 11 times in the 17th century; it has not frozen over in the last 100 years. Since 2002, the number of sunspots has been decreasing, and today there is a very low number of sunspots. However, the small decrease in solar energy has not caused a cooling of the planet.